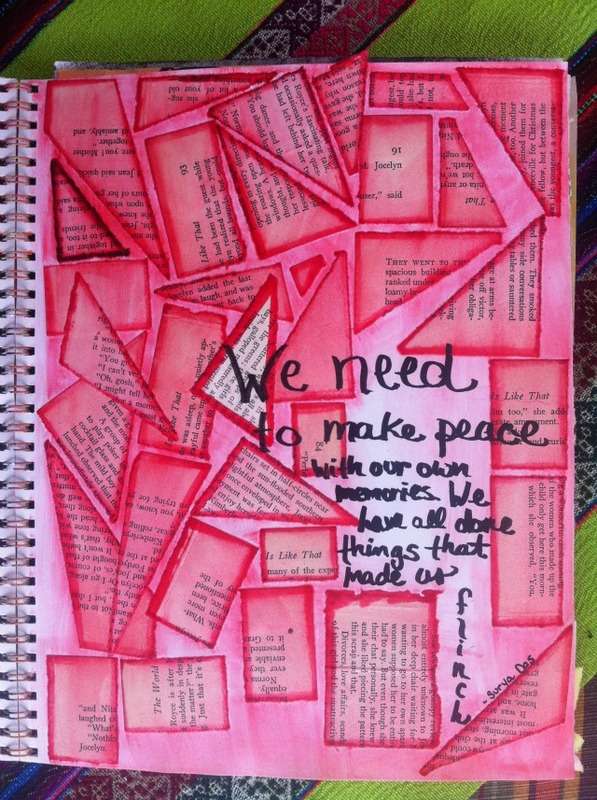 One of the things I never seem to have time for is art journaling. But I’m always so glad when I find the time. Today’s challenge is to do some form of art journaling. Elizabeth guest posted this a few years ago. While she no longer blogs, she is very active in West Michigan. And still does workshops on art journaling from time to time! Art journaling is a whatever you want it to be. Annoying, right? But it’s true. Art journaling is for you. It’s for exploring. You can explore different types of art mediums and try out different paints and styles without feeling like you have to “be an artist” or officially make a painting. Or your can explore yourself, your life, or your city. You can write about all the things you can’t talk about and paste in some bits and bobs here and there. You can collage like you used to in junior high just to create something new or feel the rhythm of the scissors and the squish of the paste. You can create a landing pad for all those little papers you keep hoarding for “something” as a visual journal of your life. Maybe it will eventually become an inspiration journal for something you want to make, design, or draw? Maybe you’ve always wanted to try sketching or cartoon drawing or fashion design and need a place to practice and write notes to yourself? Or maybe like me, the perceived perfectionism of scrapbooking wasn’t really doing it for you, but you are dying to play with all sorts of papers, and glues, and tapes, and color, and line? Art journals can be inspiration books, visual diaries, written journals with just a few visual add-ons, nature journals, collage books, artist’s practice books, or logbooks of samples from your other creative works. If you want to try art journaling, but don’t think you are artsy, it’s time to rethink your mindset. Wanting to try means that you are creative! If you did have not creative bone in your body, you wouldn’t want to try, or have the yearning in the first place. If you spend time reading craft or foodie blogs, browsing Pinterest, or looking at your friend’s DIY photos on Facebook with some jealousy, you have it. You are creative! Now is the time to honor that desire and DO it. Of all the things in life you yearn to try, art journaling is a great starting place or stepping stone because it’s just for you. No one else have to see your work. It’s your place to play or roam. And I promise you, a regular practice of art journaling will open you up in the best way. You will love it and keep at it. Or you will discover through it that you love something more and go after that specific creative activity. Or you will discover or rediscover yourself through journaling. Start with what you have. Modern life offers more than enough paper fodder to make with! Collage with the magazines, mail, and school/office papers that are already in the house. Write on the notebook paper you already have. Use your kids or your cousin’s art supplies. Composition books are great starter art journals. If you really want to get wet and messy, buy a watercolor notebook. Starting with what you have allows you to get started right away and not be hindered an any inhibitions of using fresh, new art materials or “wasting” materials you’re worried you don’t know how to use yet. It also pushes you to concern yourself more with being creative than with acquiring stuff. If you want to try art journaling the two most important things to do are to start and to make it a habit. Starting gets you off the bleachers just watching others, or off the edge of the diving board, (wanting to try but scared) and doing! Making art journaling a habit, at least for awhile, allows you to work through the initial start-up bumps and find out how it works for you and where it might lead you. Let me know if you give art journaling a try! I blog at thingsbright.com about art journaling and other creative pursuits. I love this idea! I’ve never tried art journaling but I think it would be fun AND a stress reliever for me! So creative! I’ve actually never tried or even heard of this before. But can totally see how it could like you said allow you to explore yourself without being to artsy. Kinda like a fun stress reliever, and some “me” time. Thanks for sharing the fun idea!